October 2016 Taurus Horoscope predicts that career and business will be a priority over home and personal matters for the month of October 2016 for the Taurean personalities. You can use the emotional strength achieved earlier to further your career development. The House of Love is very powerful for the Taurus zodiac sign in October 2016. This month will be conducive for romance and social activities. Life becomes enjoyable with finances thriving and marriages happening. Businessmen will start new ventures and get into fresh partnerships. The middle of October 2016 indicates job changes which are positive. There will be some disappointments at the workplace which will have no bearing on the future. Health plans for the bulls will see major transformations. Taurus, you will modify your outlook and the way you present yourself to the world in October 2016. Maintaining the right body weight will improve your physical well-being. The Taurus monthly astrology predictions for October 2016 foretell that career growth is increased with the support of your social contacts. People in search of employment will be able to get good jobs and businessmen will be lucky to get skilled employees. The October 2016 monthly forecasts for the Taurus birthdays suggest that earnings will accrue from professional sources in the beginning of the month and from family and social contacts after that. Planetary aspects are favorable for large ticket investments and big purchases till the end of the month. Single Taureans will find romantic opportunities in close family circles in October 2016. Don’t be surprised if you find your soul mate right in your own neighborhood or at your friend’s party. Social gatherings and online dating sites are another source for love. Your place of work is also a great place for finding your true love. Pregnancy too can be planned for this month as the Taurus sexuality will be at a high. 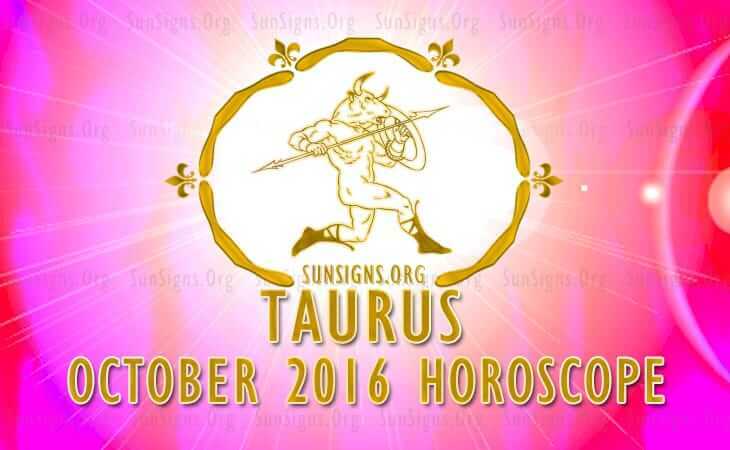 The Taurus will be endowed with good health during October 2016. You will devote your attention towards fitness and weight loss programs. Your personal charm is enhanced and you will make sure to keep your marital and social lives delightful. Your sexual vitality will be boosted this month and can be improved further be cleansing your body by chakra healing. The 2016 Taurus monthly horoscope forecasts a prosperous and fortunate month both in terms of love as well as finance.